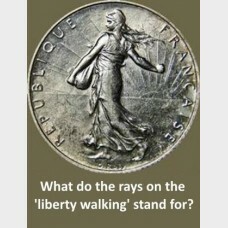 Ms Liberty is seen walking, striding actually… across the obverse side of Adolph A. Weinman’s renowned half dollar of 1916. 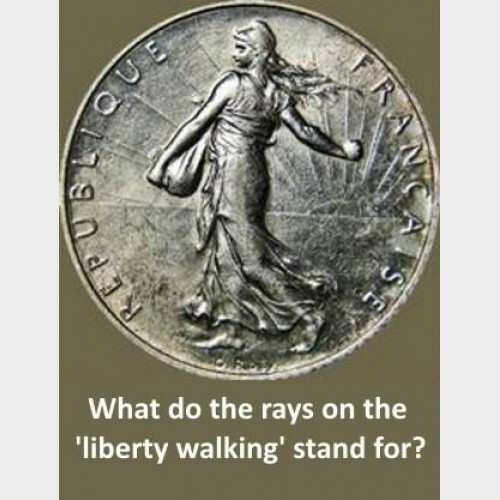 “Liberty Walking,” with rays of sunshine beaming to the front, anticipated the entry of America on the side of the Allies during World War I, projecting the US as a guarantor of Liberty over the tyranny of the Central Powers led by The German Empire. Inspiration for the Walking Liberty half may have come from “The Sower” of Oscar Roty, then appearing on the silver coins of France (see photo.) Details of Liberty’s gown and especially her head recalls Weinman’s 1909 “Union Soldiers’ and Sailors’ Monument” in Baltimore (see photo.) The heavily feathered eagle pictured on the coin’s reverse side resembles the majestic eagle of the 1907 twenty-dollar gold coin of Augustus St Gaudens. Both sides of this coin are expressions of dominion and confidence in the nation’s resolve to prevail. Though the Liberty Walking half was discontinued in 1947, its obverse design was recalled in 1986 for the one-ounce American Silver Eagle, magnified to 40 millimeters – larger even than the traditional US Silver Dollar. Next post will return to some of the earliest representations of Liberty to inspire US coin designs in the first years at the Philadelphia Mint.